Each of these plots is a cut along a Subaru Forester’s center-line. The front of the vehicle faces left. We are looking at the left side. The Diamond mounts to the right roof rail towards the rear. 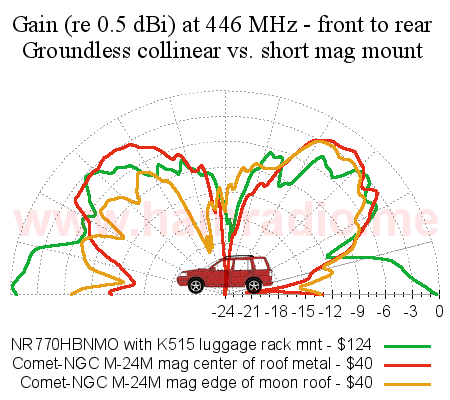 The Comet mag mount antenna is on the vehicle center-line in two positions: one directly behind the Forester’s enormous “non-conductive” moon roof and then rearward to the center of the actual metal roof area… pretty far back. The relative gain difference between the Diamond and Comet include whatever attenuation difference exists between the Diamond’s 13.6 foot RG-316/B or Comet’s 12 foot RG-58. Put another way, the antenna “systems” under test include their stock feed lines. The measured gain is from end of antenna feed line. Therefore pattern shape is reliable, but the overall gain is reduced by whatever loss is in the respective feed lines. The plots are offset together such that the outer ring of 0 dB is set to the highest gain of the three traces for easy relative comparison. The elevation cuts don’t tell the much more interesting story of how the vehicle body messes with things in other directions. However the two azimuth plots give a 360 degree sense for certain angle above horizon. 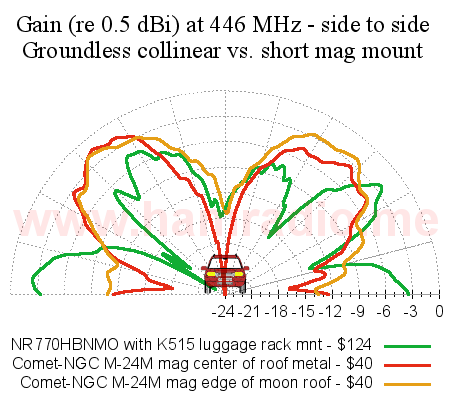 These measurements confirm, more or less, my observations after using the new antenna for about a year. Below is photo of the taller Diamond antenna and the Comet mag mount in position just behind the large Forester moon roof. 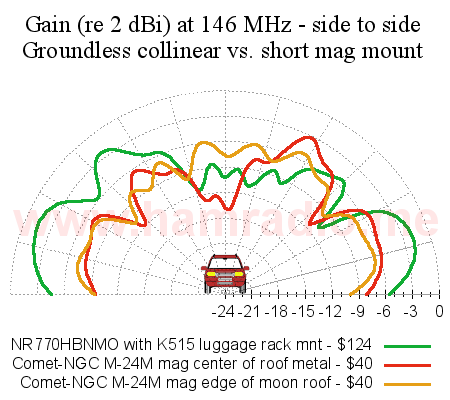 Figure 1 – Diamond collinear dual band and Comet dual band mag mount antennas in their test positions. It’s important to reiterate, this test really compares two antenna styles more than antenna manufacturers. The Comet antenna is a style available from numerous manufactures – The Diamond MR77 is one example. Comet makes collinear types such as the SBB-5. Both antennas are well constructed, have lasted very well in not so nice circumstances, and have proven to be made reasonably well so far. So really we are comparing a short mag mount and a taller end fed groundless collinear. Note: Both antennas were not up at the same time during the tests… I mean who would do that! Fair warning – Nothing is perfect in the antenna simulation or measurement biz, but the plots below show solid trends to help understand things. Enjoy! Figure 3 – Antenna patterns along the center line cut at 146 MHz. Figure 4 – Antenna patterns along the side to side cut at 146 MHz. 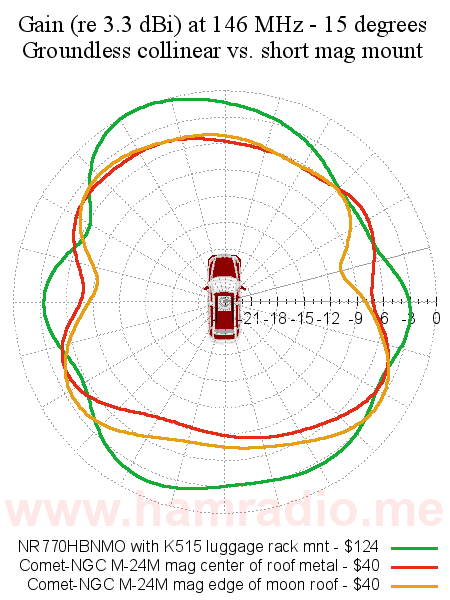 Figure 5 – Top view of VHF antenna gain at 15 degrees above horizon. The NR770 easily yields about an S unit improvement over the mag mount. The extra height of the NR770’s center of radiation help lower the angle of radiation ever so slightly. The lack of ground in front of the mag mount is quite evident. Figure 6 – Antenna patterns along the center line cut at 446 MHz. Figure 7 – Antenna patterns along the side to side cut at 446 MHz. Figure 8 – Top view of UHF antenna gain at 10 degrees above horizon. It’s clear the Comet antenna and the many others like it simply operate on the 3rd harmonic without any real mechanism in place to phase the various current peaks correctly. This despite the small coil formed into the whip… probably more for providing a good match than anything else. The result is less useful skyward radiation for the shorty mag mount antenna. In contrast, the Diamond NR770 provides astoundingly better terrestrial coverage. Humorously my Diamond tilts towards the center-line a bit as I forgot to correct it with the hex wrench supplied by Diamond. Figure 9 – Diamond NR770HBNMO at slight angle. 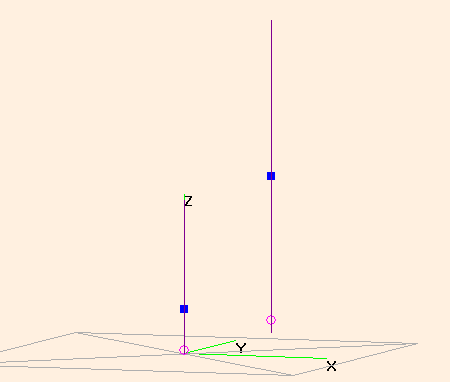 You can correlate the green antenna pattern of figure 7 and maybe figure 4 with this tilt. We can’t forget the Diamond is off center so lopsided mass of metal beneath may also contribute to this result. I think the leaning theory has more merit. Taking this point to the extreme, the K515S includes a small sheet of insulating material to ensure the mount does NOT maintain an electrical connection to the luggage rack. Figure 10 shows the Forester installation. 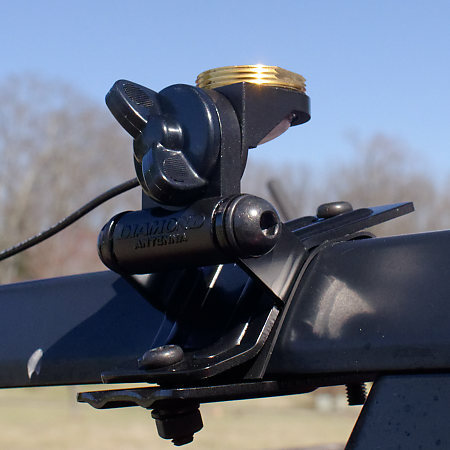 Figure 10 – The Diamond Antenna groundless K515S luggage rack mount on a Subaru Forester roof rail. Not grounding the antenna is a taboo to many, but given the results Diamond seems to know what they are talking about. The K515/NR770 combo places this antenna assembly among the end-fed topologies many folks either do not understand or just worry a great deal about. The greatest mystery of all is what happens to return currents when the coax isn’t tied well or at all to the local grounding point. The observations are it does work. Exactly why is a reasonably question. The above plots show fine performance compared with an arguable well-enough grounded (through capacitive coupling) mag mount antenna. Danger: The following is based on personal observation. 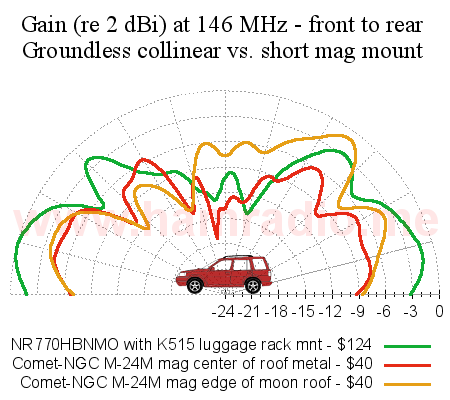 Before purchasing the NR770/K515 combo I paid close attention to the performance of my Comet mag mount antenna during my daily commutes. My commute takes me to the edge of our repeater coverage so reproducible weak signal observations were easy. The quick find at 2m reveal an easy S unit better performance over the mag mount. The plots above more or less agree with this 2m finding. I’ve had less opportunity to perform similar comparisons at 440. 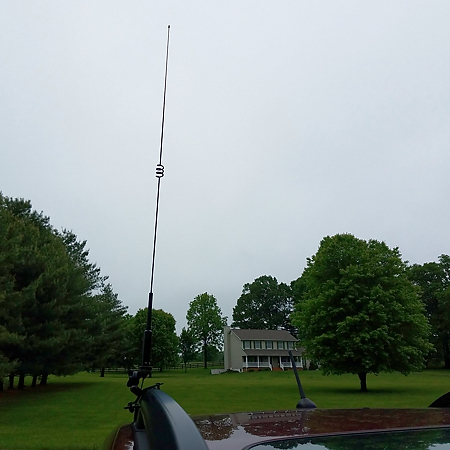 I got the chance to use this new antenna during the 2017 Virginia QSO Party (VQP) where lots of mobile to mobile contacts were made at both 2m and 440. All things being as equal as we could make them, the 440 radio links were on par or a bit better than 2m when one of the two stations was on high ground. The 440 plot does show impressive collinear performance at 440. 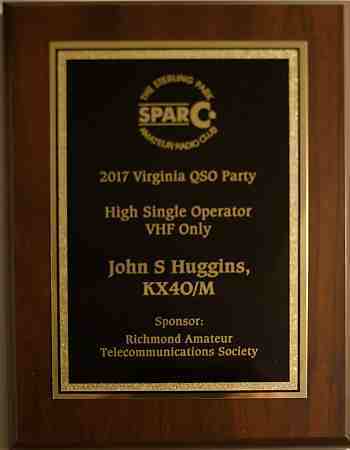 This new antenna helped win the VQP VHF Only Single Operator award. VQP mountain topping aside, there’s no doubt the new luggage rack groundless antenna is an improvement over previous aerials. Figure 12 – Roof of 2015 Subaru Forester with moonroof option. Anyone who knows Foresters understands the moon roof is enormous. We see the effect of the missing ground plane on the mag mount quite easily in the plots. The reveals a slight advantage of placing a “ground” antenna as near center of the available grounding area as possible. The benefit is more pronounced at 440. Here’s an important tip that fell out of this project. Diamond doesn’t emphasize this point enough IMO. Make sure you pair up your groundless or radialless antenna choice with a groundless antenna mount. As well match a ground-required antenna with a grounding mount. Otherwise you may well spoil the designer’s intent. Both on the air testing and chamber measurements assure me the Diamond NR770 on the K515S mounting atop the Forester luggage rack was a valuable upgrade in 2m/440 performance. 2m was about one S unit better in many directions and 440 now actually works well. There is, of course, deviations in the above patterns as the azimuth angle changes, but the overall trends are roughly the same. YMMV. This is news to me. I have a Diamond NR770 NMO mount attached to a mag mount on top of my F-150 Super Crew. 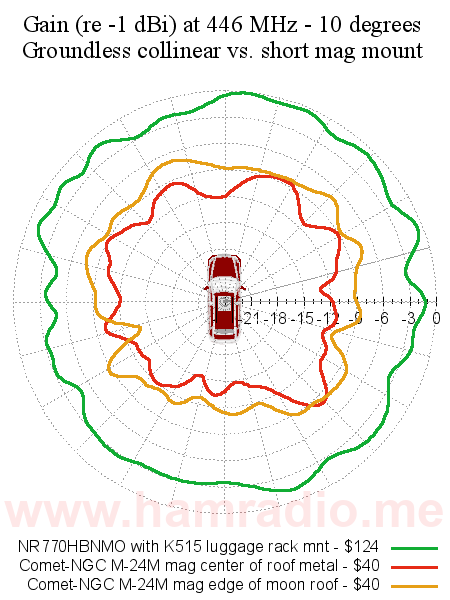 Should I be looking for a groundless antenna mount instead? To be honest, Kevin, I'm not totally sure. I'm just going by what the various notes embedded in the various instruction sheets suggest. I will need to look into this a bit more. Stay tuned. Hey John, Thank you for sharing this thorough work. I have a Subaru Crosstrek. 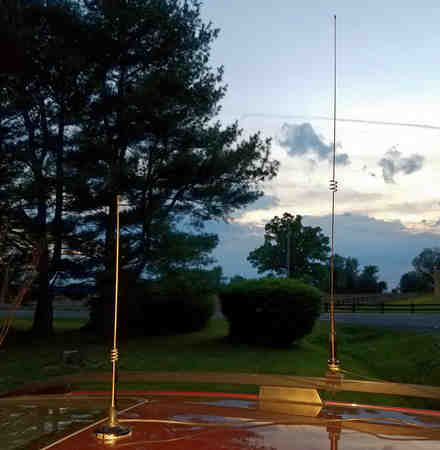 I've been scouring around trying to figure out how to mount a CB antenna on the rack. Here are my questions for you. Is the diamond mount available without the antenna wire or is it removable? I already have a Firestick antenna cable installed in my car. I tried their magnetic mount and it couldn't hold up the Firestick antenna above 40 mph. I noticed that there are options from Comet that come wire-free. Do you prefer the rack mount over lip mount options? Thank you very much for whatever your take is on this. The K515S mount is separate from the NR770 antenna so you could, in theory, use the K515S for 27 MHz CB use. The trick is getting or making a whip with its matching coil that is essentially the equiv. of an end-fed antenna with low sporadic currents along the feedline and mounting structure. Most CB antennas for mobile situations are going to be 1/4 wave or shorter styles that require a robust shield current to be handled by the mount. This is a tough one for something like the K515S to handle. Will have to think about this a bit.